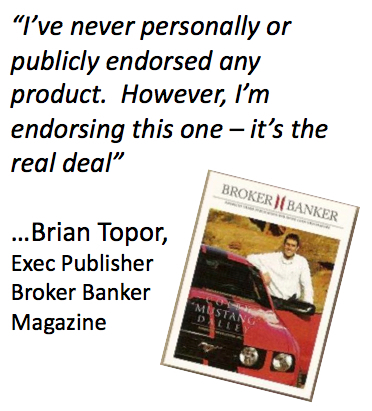 Banks & Lenders; Benefits of Being a Worth "Referral Partner" OR by "Private Labeling" the Worth Account as YOUR product! … helping clients to help themselves reaps BIG rewards for lenders. In this economy lenders have various concerns, all inter-twined, but all related to one thing: their clients credit-worthiness. While not everything is within the control of lenders, or even their clients, there is something that can be done to help insure a profitable and stable relationship into the future. More than 30 percent (almost 1 out of 3) of the U.S. U.S. Federal Housing Administration loans originated from 2007 through 2009 will be delinquent within five years and the agency’s data UNDERestimate that risk, according to a study by the Federal Reserve Bank of New York and New York University (read more). Loan officer retention. Can their best commission based LO's make enough income so they don’t risk losing them to a competitor? 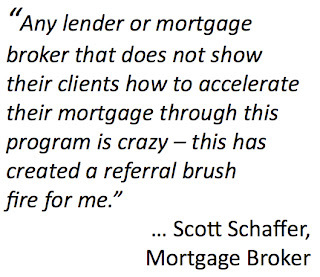 Are they losing potential clients/borrowers to competitors with different, or better, mortgage programs? 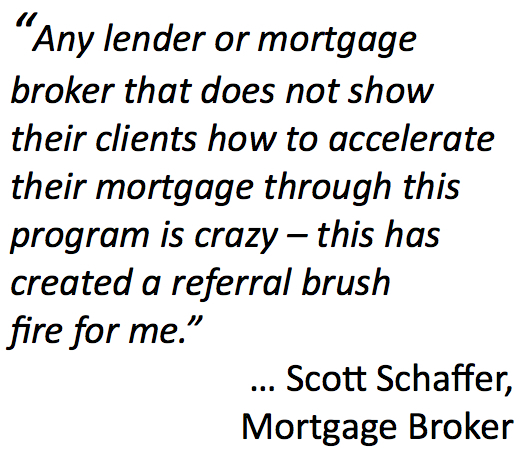 WOW… and, of course, the CLIENTS have many of these same concerns as well, as it gets harder and harder to finance a home, and do so with a sense of security for the future. The Worth Account, by Worth Unlimited is the answer! What IS the Worth Account? It’s actually an intuitive, interactive and AWARD WINNING financial management system that consists of both an online software program AND unlimited, live support, from a Worth Coach. The average Worth Unlimited client is paying off ALL their debt in 7-11 years. This includes a 30-year mortgage (as well as consumer or student debt) and, best of all, does NOT require them to change their budget! 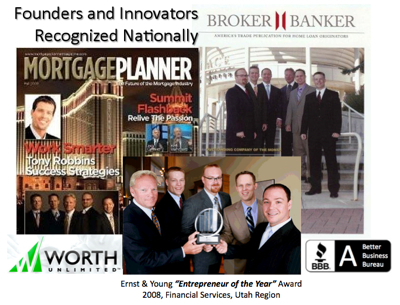 Results for Worth Unlimited clients include an average of over $120,000 in interest savings. That’s $900 in interest savings (amortized) for each month they use the program till debt free. The “how does it do that?” includes banking strategies that utilize factorial math algorithms which advise the client when to move money (and how much) in order to get the client to the quickest way to zero debt, paying the least in interest. We know that's a "mouthful," but do clients need to know “how” it does this? Not really. They just need to know that the “math” gives them an extra “edge” over what even the most disciplined financial “pro” could do on their own; hence the Awards the company has won, and it’s “A” rating in the Better Business Bureau. This software is sophisticated in it's design... but SIMPLE to use. Another “how” simply involves this: financial discipline. In studies it has been shown that, of all the people who visit a financial planner, that only about 14% of them will stick to that financial plan through the end of year one. By year two, it drops to 11%. There are many reasons why people are not as financially disciplined, as they would like to be. Our consumer culture offers many temptations. Most of us are not “educated” in the ways of finance, and simply don’t understand the impact our spending has. But, most of all, until now, there has not been a tool that really shows us the “big picture” of our financial life and, as the Worth account does, also calculates and advises the "roadmap" to debt elimination and wealth building. This is what the Worth Account does. It pulls every aspect of a client’s financial picture together into one central dashboard showing them exactly when they will be debt free, how to get there, and exactly how each and every aspect of their spending is impacting that goal. When you SEE it… you can AFFECT it. How successful is the Worth Account in helping people to “stick to” their financial plan? 95% of client are STILL “on track” after 4 years. Not one year – FOUR years! The average client is getting 20% BETTER savings than was projected for them when they first activated on the system. There are over 70,000 Worth clients. So, a client who’s Savings Analysis shows they will be debt free in 10 years, and save over $100,000 in interest? They have a good shot at doing it in 8 years and saving over $120,000 instead. Think this MOTIVATES clients? You betcha! So… how does this HELP Banks and Lenders? Very simply: The Worth Account is a perfect “value added” service that a lender can offer to a client at “point of sale” (or application). A tool that, once a lender gets their client activated on it, will certainly increase the success that client has with living up to their debt obligations. 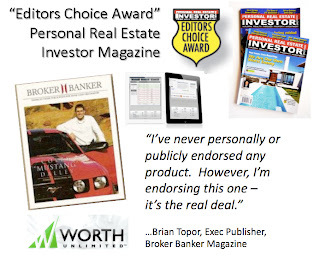 The Worth Account helps clients create a solid financial foundation so that they can “step up” their life and be a loyal REPEAT customer of that lender as they buy their next home, or perhaps, income producing property and, of course, as they REFER others. Helps clients increase credit scores and decrease debt to income ratios (DTI)… so it’s GREAT for those “turn downs;” to improve your approval rates in the future. Helps clients build EQUITY in their real estate quicker… decreasing “walk-aways” even in a less stable market and shortening time between refinances or next home. 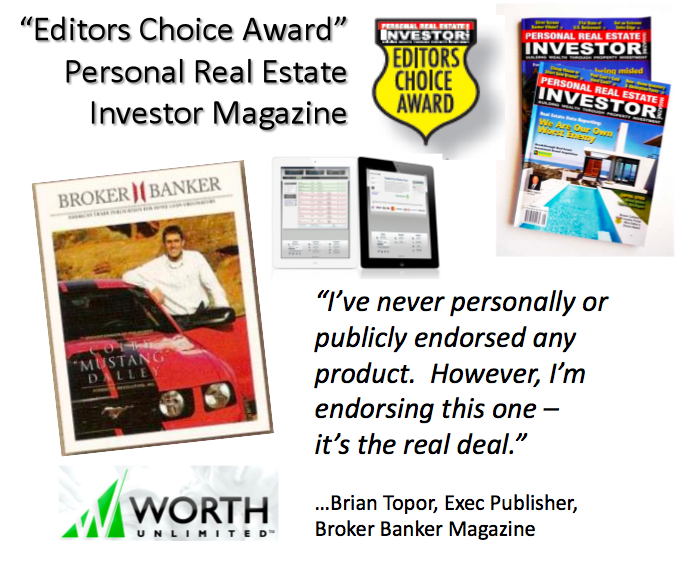 Attracts more clients interested in building real estate INVESTMENT portfolios. Clients can generally have 5 houses “free and clear” in the time they would normally spend paying off 2 or 3. For lenders, that’s more loans! Prospecting and MARKETING! Worth will provide you SEMINARS and workshops that will bring NEW customers in your door and get them EXCITED about doing business with YOU. No extra time or “fuss.” When you are a “Referral Partner” of Worth, you need only refer your client for a free Savings Analysis and you are done. Worth Unlimited does ALL the work… from the Analysis, through to the follow up and activation. PRIVATE LABEL options now avail that will "brand" this product as YOURS! Two of the top 6 banks in the US have tried to purchase our company in order to get our product... offering millions of dollars. Now YOU can brand this product as yours and set yourself apart from your competition. Private Label accounts allow you to set your own commission plan for your associates, set your own pricing, etc. how commissions work when you just refer & earn"! customizable so ask us for info on those.